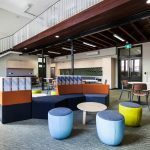 In collaboration with Point Project Management, IA Design were appointed to design the Cisco Internet of Everything Innovation Centre (CIIC) situated on Curtin University’s Bentley Campus, in partnership with Woodside Energy. This exciting new innovation centre was designed to bring together start-ups, industry experts, developers and researchers in an open environment to create ground-breaking and innovative solutions that foster growth, provide jobs and help build sustainable outcomes. Having worked previously with Curtin University and CISCO, the IA Design team had extensive knowledge of the project parameters and successfully delivered an outstanding design. The design included collaborative working spaces, demonstration areas, and a productive and experimental environment that is open to students, researchers, industry operators, technology services providers, start-ups and other innovators. The space successfully promotes teamwork and collaboration, supporting the university culture and improving connectivity between all user groups. The final design is a refreshing, flexible and exciting addition to the Bentley Campus, which has met and exceeded the client’s expectations.